Be the first to share your favorite memory, photo or story of Denis. This memorial page is dedicated for family, friends and future generations to celebrate the life of their loved one. 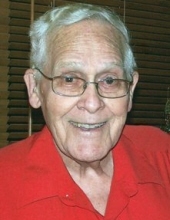 Denis Racine Ratliff age 92 of Pikeville, Kentucky passed away Thursday, July 12, 2018 at his home. Denis was born at Hellier, Kentucky on June 1, 1926 the son of the late Pankie and Mary Sanders Ratliff. Along with his parents, he was preceded in death by one brother, Gordon Finley Ratliff. He is also survived by four grandchildren, Denis Cleveland Justice, Becky Lynn Przygoda, Amy Elizabeth Hixon and Nathan Andrew Ratliff and six great-grandchildren plus expecting one. Drafted into the US Army at age 18 at the end of WWII, he served his country in Japan and the Philippines. He graduated in 1949 from Bowling Green College of Commerce with a BS Degree in Commerce with a Major in Business Administration and a Minor in Accounting. On his 25th birthday in 1951, he married Patia Lee Massey, daughter of Kennred Augusta and Sarah Jane Massey. He worked as a bookkeeper for coal companies, was over the business office and worked as Comptroller at Pikeville College for 14 years, then worked at Citizen's Bank as Internal Auditor until his retirement. He was a Kentucky Colonel, Past Master of Thomas C. Cecil Lodge, Member of Anna O. Young Chapter of the Eastern Star, Member of El Hasa Shrine, and a Member of the American Veterans. He enjoyed traveling, gardening, camping, and square dancing. He was a master woodworker and maker of fine Shaker Oval boxes. He and Patia were baptized on Easter Sunday, March 27, 2005 at Grace Baptist Church, Shelbiana, Ky.
To send flowers or a remembrance gift to the family of Denis Racine Ratliff, please visit our Tribute Store. With Masonic Rites at 6:30 p.m. and Eastern Star Services being conducted at 7:00 p.m.
"Email Address" would like to share the life celebration of Denis Racine Ratliff. Click on the "link" to go to share a favorite memory or leave a condolence message for the family.